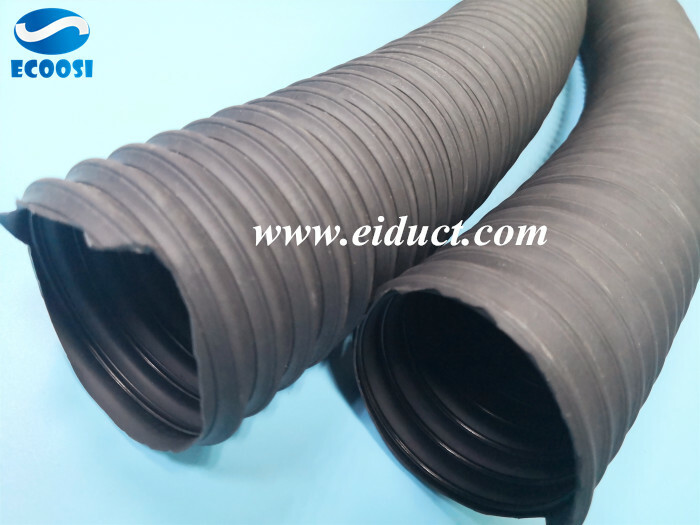 Why Ecoosi thermoplastic flex rubber duct hose is ideal for high temperature air and fume applications? What kind of performance does the woodworking machinery vacuum hose need to meet woodworking workshop? 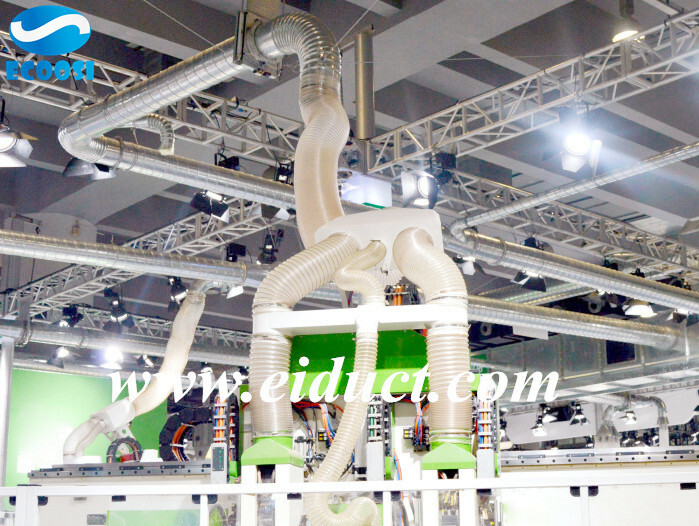 Ecoosi PU flex steel wire woodworking dust collection hose for woodworking workshop dust removal performance characteristics: light steel wire wear-resistant flexible hose, polyester polyurethane duct hose with copper-coated plastic wire ribs. What is the application of Ecoosi PVC flexible nylon fabric air ventilation duct hose? 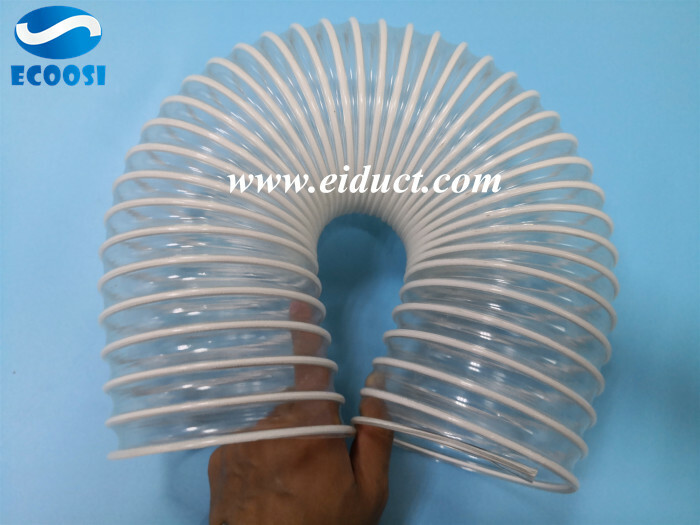 High Temperature Silicone Brake Cooling Duct Hose From Ecoosi Industrial Co., Ltd. If you need to add brake duct hose to your track or race car, try Ecoosi high temperature brake cooling duct hose.This high temperature brake cooling duct hose direct air from front mounted air ducts to spindle ducts for brake cooling. Industrial PVC flexible suction hose from Ecoosi Industrial Co., Ltd.
PU(Polyurethane) flex material handling ducting hose from Ecoosi Industrial Co., Ltd.
Ecoosi PU(Polyurethane) flex material handling ducting hose is a flexible air duct hose featuring an excellent chemical and abrasion resistance and high tear strength. Its spring steel wire helix provides extra support and durability. 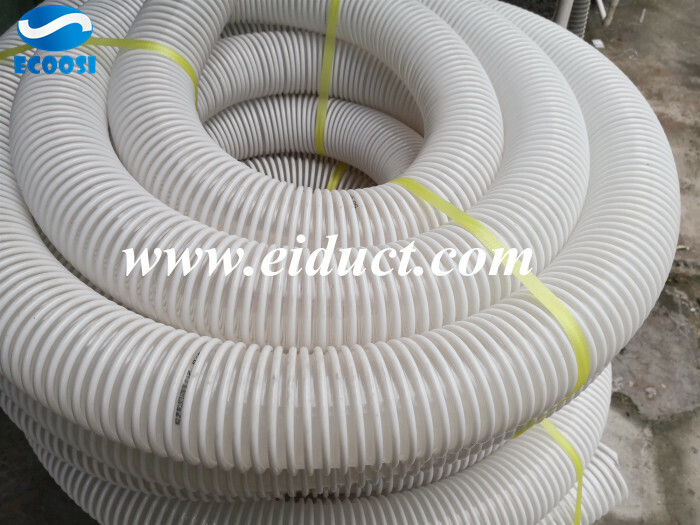 Flexible smooth interior dust collection suction hose from Ecoosi Industrial Co., Ltd.
Ecoosi flexible smooth interior dust collection suction hose is a material handling hose ideal for dust collection and other material handling applications, this flexible suction hose has a smooth interior that maximizes flow within the suction hose. 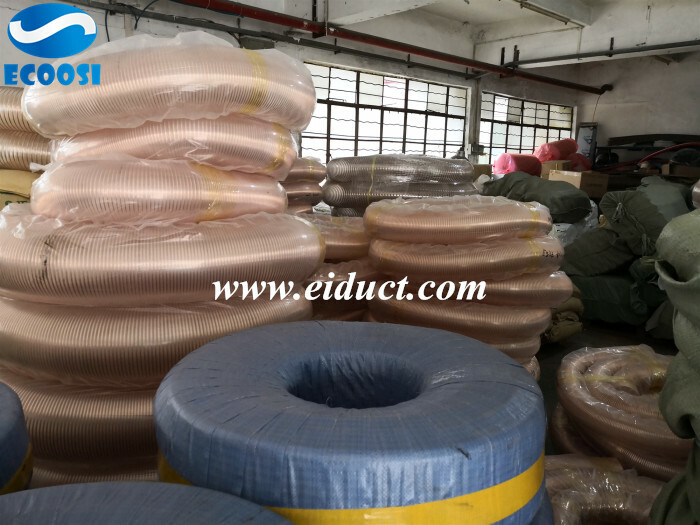 PVC clear steel wire reinforced flex ventilation duct hose from Ecoosi Industrial Co., Ltd.
Why Ecoosi PU flex copper coated steel wire duct hose is so popular? Why Ecoosi PVC flexible suction hose transport hose is ideal for water supply and abrasive solids such as dusts, powders and chips, grains? Ecoosi PVC flexible suction hose transport hose is ideal for water supply and abrasive solids such as dusts, powders and chips, grains.